Enjoy craft cocktails from Yahara Bay Distillery, 3 crafts to particpate in and take home, delicious appetizers to indulge in and 4 story tellers to listen to while crafting and sipping! Details: your $40 ticket includes 1 craft cocktail and discounted drinks all evening. Appetizers. 3 crafts all materials included and the enjoyment of listening to 5 amazing authors and poets: Ann Garvin, Ann Imig, Dana Maya, Katrin Talbot and Oscar Mireles. Doors open at 6 PM. Storytellers read from 7-9. All set at Yahara Bay Distillery. 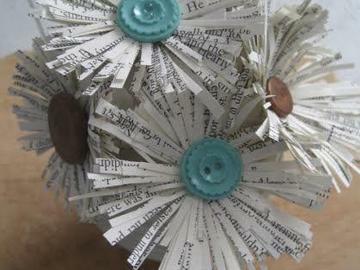 Yahara is providing a bottle for each of us to fill with literacy crafted flowers. You'll also have time to craft your valentine a card and make a heart in a book, all to take home! Madison Reading Project is a local nonprofit that provides books and programming to vulnerable children in Dane County. More can be found at madisonreadingproject.org and social channels.